Sara - Radiant and tighter skin! Ching0805 - I love it! It cleans up the skin very well and fast, but the continuous usage is unavoidable. I'm up to my third one! I had to experiment with this product and now i really like it! For me it works best when used 2 - 4 times a week! If i use it more my skin will become rough and will start to peel. However, when i use it 2 - 4 times a week i can see an improvement in fine lines and KP on my face! Wonderful product that lasts for a long time! This was my first PC product and now I wouldn't use anything else. Being in my mid-30's I was frustrated to continue to suffer from monthly cystic acne outbreaks and read that a mild/moderate AHA might help. Not only has this product reduced my outbreaks to 1 - 2 per year, my skin has actually taken on a glow that is noticeable by colleagues and friends. My routine alternates the 2% AHA twice a week and the 10% AHA 3 - 4 times a week. I have subsequently begun using the Resist cleanser and toner which seem esp. suited to winter months/drier skin. Thanks to this treatment, I love how my skin feels and looks every morning. I am a big fan of Paula's Choice skin care products, read all her books and constantly recommending to all my friends and family. After reading so many great reviews about RESIST ANTI-AGING 10% AHA WEEKLY TREATMENT I was persuaded to try it for the purpose to ' reveal younger-looking skin overnight' and to 'see fewer wrinkles' as claimed on description. I have already used halve of the bottle but it did not effect my skin at all. It just did not change anything. So a bit disappointed to have wasted my money. This caused a horrible burning sensation all over my face and it turned red. Had to wash it off but the burning continued. Usually I don`t even have sensitive skin but obviously AHA isn`t for me. Luckily I only had a sample. Customer Care: We are sorry to hear about your experience, if we can be of any assistance finding an alternative product, please contact us. Philip - Burning sensation on my skin. Caused breakout. This product sadly caused a burning sensation on my skin (I tried a sample). At first I thought i would pass quickly but it became painfull, so I had to wash it off after a minute or so. Caused pimples and extra skin sensitivity in the days following application. This is my first use of an AHA exfoliant, so maybe that just doesn't work for my skin. Maybe it was because of the high percentage of AHA. It doesn't seam like a bad product. It just really did not work for my skin. Customer Care: Thank you for your review. We are sorry to hear of your discomfort and experience. Although this is not a common response, we do understand that each customer is uniquely different in how they will respond to products or ingredients. In general, it may take some experimentation to find the best skincare products. You are always welcome to contact our Customer Care department for any recommendations or advice. I love this! My skin looks and feels amazing when I use it. The product itself is amazing, it makes my skin smooth as a baby bum, plumped and firm, and my fine wrinkles seems erased. What's even more amazing is Paulas Choises customer service. You're the most service minded business I've dealt with, with very fast, well informed and kind responses. I'm such a happy customer! I'll never buy skin care anywhere else again. Thank you. It's a rather good exfoliator. Unfortunately, not as good against brown spots. I actually, after 7 months of using it, have seen NONE effects on my brown spots (all while using daily broad spectrum SPF50 of course, which goes without saying, especially when using AHA / BHA products). I would also prefer it in a kind of more gel/jelly texture, as this product is indeed as liquid as water, so it's not easy to use it, lots of product gets wasted just cause of inconvenience of packaging (no pomp) and its texture. I love this product. It is working like on descriptions. Powerfull exfoliator, no irritations. I am 49 and this product made miracle on my skin - no more lines, just nice soft baby skin, with a fresh color. I do not need a make up. One more - this product is perfect to fight with a old scars. On my left hand my big old burning scar is disappeared!!! THANK YOU !!! I gave this to my mum as a birthday present and have tried it myself. We both think that it's amazing, makes my mum's skin so much smoother and more supple. She has aging,very dry skin with enlarged pores. This made her pores become much smaller and her skin tone is so much more even. Overall I liked this product very much. Going to get it for myself too with my next order. The first two times I used this, I didn't notice anything unusual. However, the last two times my face has been like sun-burnt the next day, red and irritated. I have kept at least a week in between treatments and don't use any other exfoliants at the same time. Maybe this is just too strong for my skin. Customer Care: Thank you for your review. We are sorry to hear of your experience. Possibly this exfoliant is too potent for your skin. Please contact our Customer Care Team should you need further assistance. Probably one of the best if not THE best exfoliant out there. Awesome results overnight, just as it says on the bottle. My only warning goes to those with very sensible skin: that stuff is really strong, so use it sparingly; once a week is way enough. Still, like I said, amazing stuff! I use this 1-2 times every week and this is probably my favourite product from PC. There has been a dramatically improvement in my skin texture and overall look since I started incorporating this into my routine. Really a great product and highly recommended. This product is really excellent. It makes skin glowing and soft for a few days afterwards I use it. I have combination skin, oily T zone but dehydrated, with lot of blackheads on nose and chin.I first started using BHA 2% gel at night, then Resist AHA in the morning. Now I started with Weekly resurfacing 10% once a week and it all works perfectly. Even my husband noticed the difference without me telling him! What is best, my blackheads are almost gone due to BHA gel. I have to say thet at first my skin was peeling too much when I first started with BHA but then I applied it every 2-3 days and I got used to it. Overall these three exfoliants that I am using are great choice and first time in my life (I am 41) my skin looks really clear. I still need to manually extract blackheades once in a while but it is easier and they are fewer. I am just sorry that I did not tried PC skincare before, because I spent a lot of money on very expensive creams without big effect. I can't believe the results from this product! I've been suffering from uneven, red, acne scarred skin sence I was a teenager and the last couple of years some dry wrinkles as well. My skin is transformed after a month of using this treatment twice weekly, I'm so happy! Thank you! Everybody might not get fantastic results as I recommended it to a friend who didn't get my raves about the product, but for me it's a miracle <3. I really like this product, took off one star for the consistency. It makes my skin feel smooth and glowing. I had to work up tolerance as my skin is sensitive. I can now use it twice a week overnight with no irritation. I like this product. But its consistency is that of a liquid. Thus, if poured on a finger it runs, and if used with a cotton, much product is wasted (and the bottle is not big). Therefore, I wished the consistency was more like that of a light gel, which would make it a lot easier to apply. I bought this exfoliator, because I wanted to see if it had any effect on my breakouts. And WOW it did! I use it 2 times a week - to get the maximum effect. Together with the RESIST Skin transforming multi correction treatment, and the BHA 2% on nights I don't get any breakouts! I love this product! I use it just twice a week after cleansing and let it stay on overnight. In the morning my skin is amazingly clear and smooth. What's great about it is that it seems to tighten without being harsh and smooths without drying. I have dry skin in the winter, but leaving it overnight twice a week without moisturizer doesn't dry my skin and it works a treat! Highly recommend this for a weekly skin lift. I have used this for about a month and must say I am impressed. My skin gets smooth, even and radiant. I can even use this before putting on make up for a night out as the skin does not get red as with for example enzyme peelings. However, I have found that if I let it stay on for a longer time, my skin tend to break out into small bumps and pimples, so I stay with about 10 minutes and then wash off. Normally I use it twice a week with a moisture mask in between. I have tried samples of the Daily Treatment which is recommended to alternate with, however, I notice a tendency to break outs when using this too, so I’ll stay with the Weekly treatment for a while longer. I also tried experimenting with this with the bha 2% lotion. It also did nothing for my skin, pimples or the cystic acne i got from the aha. I triede only using one, one day and one the other (always bha for the day and aha for the night). I tried using only one at a time and i tried using both on the same day. No results. Customer Care : Thank you for taking the time to review this product. We are sorry to hear about your experience.. This particular exfoliant is designed to be gentle and soothing. Our BHA exfoliants are much better options for those with very dry, sensitive skin or that did not respond well to an AHA and are also anti-aging. Please contact customer care so that we may suggest a complete routine of products for you to offer the most visible change in your skin and prevent the signs of aging as much as possible. The skin is very complex and needs a comprehensive consistent routine of products to reach the best possible results. Silvic - Worth the money! I have been using this product since it became available together with the daily treatement and it has made such a difference to my skin. My skin is combination, sensitive, with blackheads, raised red spots, dry patches, uneven skin tone, blemishes and breakouts. Since using this product (together with daily treatment) I have no bleackheads, no raised red spots, no blemishes or breakouts, no dry patches and my skin tone has improved so much I now only wear pressed powder. I use this product twice weekly now (as instructions said that this was acceptable however I know note that it states use once a week). Customer service - could you please advise why this is? Customer Care : Thank you for such a great review! The RESIST Weekly Resurfacing Treatment can even be used up to four times a week. But this depends on the condition of your skin. If you have any questions please feel free to contact our customer care team. We are always happy to assist you! Isabelle - Best thing ever !! This is the most effective product I've ever tried, it totally outlived my expectations. My skin is soooo smooth after I use it ! And it literally ironed out my frown lines after a couple of uses. Pure magic ! The only flaw is the texture, it's basically like water so it's really hard to "handle". What I did is transfer it into a small roll-on container, so I can apply it with more precision, and I waste less product. charlotte - Will NEVER stop using this product! Like the other reviewers I cannot say enough good things about this product! My skin looks impossibly smooth when I wake up after using it, just incredible. This is by far my favorite of all the PC products I have tried (mostly Resist products). I take half or even a quarter of a cotton ball and use that to apply the product-that works really well, and it really doesn't take that much product. If you are new to Paula's products, cruising product reviews wondering which one product to try, just like I did months ago, this is the one product to spend your money on! You will be so amazed that you will quickly place an order for more PC products, trust me! Like the other reviewer, I really feel like this product is responsible for getting rid of (honestly, at least 90% worth) of the awful 11 lines between my brows, as well as some strange wrinkles over my eyebrows. I've google it, and I still don't understand how it works, but I'm telling you I will never stop using this one. I think it's a very good product, but for the price I think it's too expensive. Only have 2 oz. Should be 4 oz. at least. I expect a lotion but is liquid like toner and you loose a lot of product if you use a cotton to apply it. For the ingredients I think it's 5 stars. Eric - Only 3 letters : WOW !!! 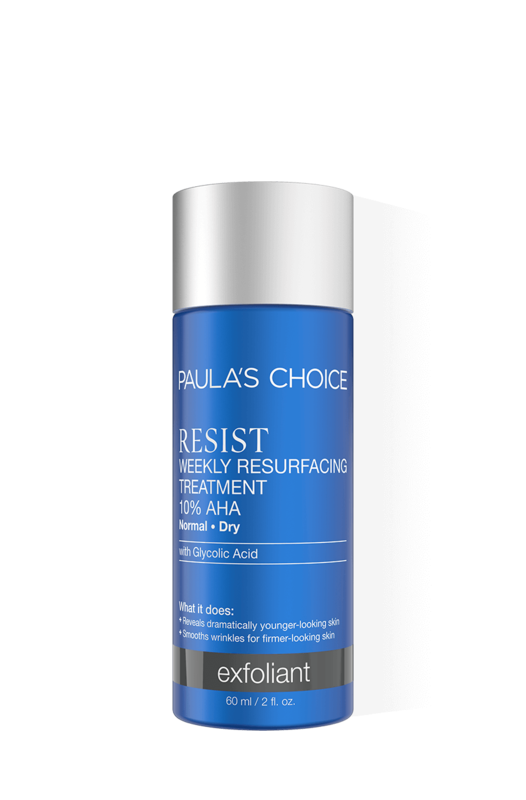 I've always been more than pleased with Paula's products, but this time I'm amazed (and addicted) with the RESIST Weekly Resurfacing Treatment 10% AHA !! It tooks 2 weeks (with 4 applications per week) to remove all dead skin layers (I never would think I still had so much dead skin to be removed as I regularly exfoliated with Paula's BHAs). I had strong flaking the very first week, less the second one, and now almost none... all of this without any redness or burning sensation, just a very light tingling (that I can't describe as unpleasant because it means the product is acting, so I love this sensation).Now my skin is glowing, it retains moisture far better than ever before. Just like the toner within the same range, the packaging is beautiful but would be more practical with a pump. This product is a true holy grail ! Same review I made for the 'Daily Smoothing Treatment' applies here but with the difference that concentration here is higher so It must be used less frequently. Its texture, color and smell isn't as attractive as it's for the other product but anyway It deserves the same good consideration. Honestly I think Paula has made a next level AHA's with these products which make your skin look/behave younger and healthier. Simply awesome.